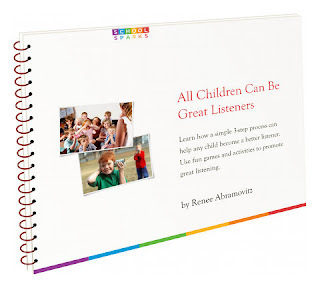 Free ebook "All Children Can Be Great Listeners"
This is the solution for the triangle problem with equal areas that I posted earlier. 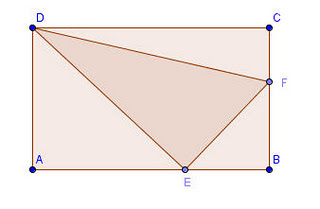 We are given that the areas of the three right triangles are equal, that is the area of the triangle DAE = area of the triangle EBF = area of the triangle FCD. We will make an equation based on that fact. For that, I like to use x as my variable, so I denote the longer side of the rectangle with a, the other side with b, the distance AE with x, and the distance BF with y. We are asked the ratio AE:EB, which is the same as x : (a − x) using my notation, and the ratio BF:FC, which is the same as y : (b − y) using my notation. The area of triangle ADE is its base times altitude divided by 2, or bx/2. The area of triangle EBF is its base times altitude divided by 2, or y(a − x)/2. The area of triangle CDF is its base times altitude divided by 2, or a(b − y)/2. Bon from Math is not a four-letter word made this little counting song, sung to the tune of "Twinkle Twinkle Little Star". Hope your little ones enjoy it! SORRY I forgot to post it here (I just sent this to my email list). Use the coupon code THREEDAYS. I hope Pat doesn't mind that I copied the image from his blog... 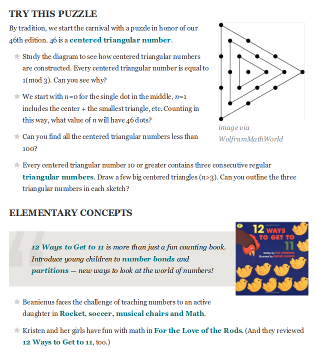 He posted this triangle puzzle on his blog and I thought you might enjoy it, too! And, we're asked to solve the RATIOS AE : EB and BF : FC. Well, this IS something different! 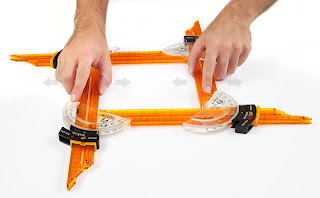 A physical ruler that can draw shapes with any angle measure you want. This ruler give you accurate measurements for every side and angle. You can connect sides to form angles, which scale and skew smoothly, and you can lock angles and sides. Cool! I just learned about Vi Hart's "doodling in math class" videos (hat tip goes to Fawn Nguyen). Binary Hand Dance was pretty cool too! Denise's done a beautiful job with the current Math Teachers at Play carnival number 46, lots to read and explore and see... head on over! Please send me the formula for compound interest and explain line by line. What does the 1 stand for and must you add it to the rate of say 10%? Obviously I am looking for a basic course? but this formula doesn't give us the amount of interest -- it gives us the amount of money you would withdraw after t years. In the formula, p is the original principal, r is the interest rate, and t is the time in years. However, we cannot put the interest rate in as he did. If r = 10%, then r = 0.1 must be used in this formula. In other words, FIRST convert your percentage into a decimal.